Quality is guaranteed when it comes to wrought iron work. Take a look at our gate and railings gallery to see some of our latest projects. Our full range of iron gates can be viewed. From a simple garden gate to the grandest of entrances to suit a stately home each project is approached with the famous Lite Fabs and Coatings Nottingham attention to detail. 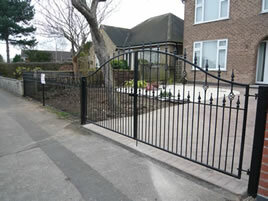 We are justifiably proud of our gates and railings, they lead the field in design and installation. Every installation is made to our clients’ individual requirements, we simply do not do “off the peg”. We do however manage all this at very competitive prices to ensure value for money at all times. Our electrically controlled gate and access systems are all installed by NIC registered staff, ensuring the highest standard of safety and reliability. An NIC certificate to comply with health and safety standards supports each installation.